Studio 5380: This is gonna sting a little! Hi there! Today is a special day for me and I'm so happy that you stopped by! Today is my first "official solo post" on the Peachy Keen Stamps Blog! EEEK! I'm going to share a bit of my post here, but I would LOVE for you to stop by the Peachy Keen Blog and check out my project if you have a chance. It would mean so much to me to see my sweet bloggy friends come by for a visit! I created a fun "Shadow Box Card" from a file available at the Silhouette Online Store. I used lots of Martha Stewart coarse glitter on this one - I love the sparkle! I also added some pretty velvet ribbon and a few felt hearts. I really love the way Cupid seems to be floating in the clouds! Thanks so much for stopping by today and I hope you will stop by the Peachy Keen Stamps Blog for more details on my shadow box card! Adorable Shadow Box Card. Love image too cute. The ribbon added really adds a special touch. This is gorgeous!!! I love cute cute cupid and the dimension is awesome!!! Tanya, this is absolutely FABULOUS !! I saw it while I was at work and my jaw literally dropped :) Great job my friend !!! Gorgeous. I love everything about it. super cute, Tanya!! you always put so much work into your projects!! This is a real wowzers Tanya.Love your shadow box and your beautifully coloured Cupid. Tanya ~ OMG! Look at your shadow box!! I LOVE that stamp and how you colored her!! The sparkly hearts and clouds! Then look at how you used the ribbon to tie that shadow box up!! TOO CUTE!!! As always so enjoy your creations! This card is just AWESOME Tanya! I love all the depth and sparkle! 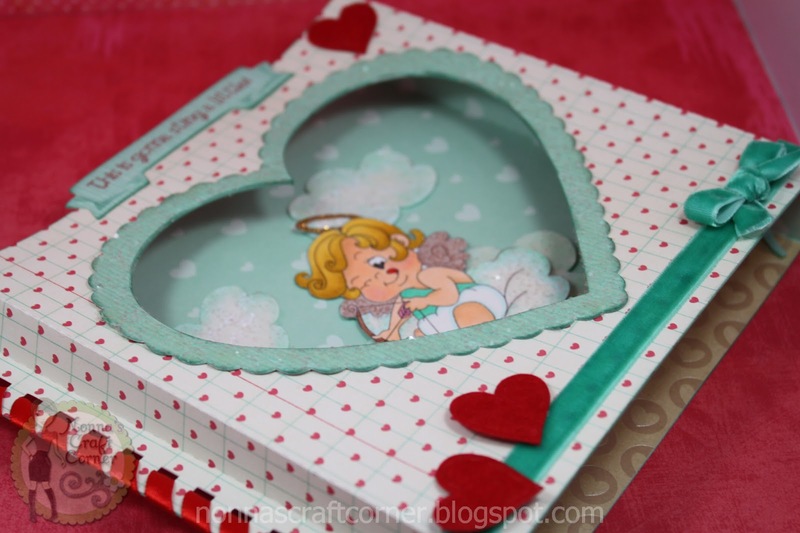 The sewn ribbon sides are stunning and you colored the cupid beautifully! Awesome job! Fabulous card - love all the details of this. I'm off over to leave you some bloggie love! Absolutely Gorgeous. Love the colors and details. Awww this is so cute and perfect! I love this card! This is adorable, Tanya. 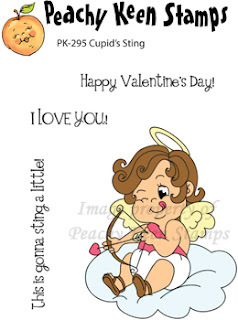 That cute cupid is colored beautifully. PK is lucky to have you. This is soooo cute!! That is a sweet stamp! I like the glitter!! OH MY GOSH!!! I can't stop looking at this amazing sweetie! I LOVE all the sparkle and how she is sitting a fluffy cloud! So stinken adorable! Stunning details my friend! You did an AMAZING job on this!!! !